At the recent forum “Plotting the Future of Cultural Journalism,” an energized, standing-room-only crowd of Philadelphia’s cultural thought leaders came together to try to solve a troubling problem: that our arts community is growing as fast as newspapers seem to be shrinking. How do we adjust to today’s rapidly changing media landscape? What can we do to ensure our stories get told? If art exists and no one writes about it, did it really happen? Keynote speaker McLennan started off the event with some sobering statistics: Since the year 2000, more than two-thirds of arts-journalism staff jobs have disappeared. 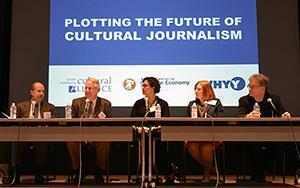 “We are in a time of a lot of upheaval across the entire creative field,” he warned, “and we are about to go into more turmoil.” But McLennan also cited successful new developments in digital cultural journalism — from small, local, engaged blogs to public radio’s expanding commitment to arts coverage in markets across the country. Promising new business models include those that combine advertising with an involved, passionate audience willing to pay membership fees. McLennan also noted the increasing influence of social media, digital content and marketing on audience engagement: “Today, no cultural experience is complete until it’s been shared. We want to be the curators of our own experiences.” Wendell agreed, encouraging institutions to adapt to reduced arts coverage by becoming creative connectors, strategically generating and repurposing content across social media platforms, as well as bringing communications experts to the table for programming and audience-building discussions. The journalists on the panel weighed in on the kinds of arts stories that are most likely to secure that coveted coverage. Marimow asked for stories that “humanize an artist striving to do excellent work.” Wendell encouraged arts organizations to “find stories that can live beyond the arts section and connect to the city.” Satullo echoed these insights, saying that what gets journalists really excited about arts stories is behind-the-scenes access. Thanks to the Greater Philadelphia Cultural Alliance, the City of Philadelphia’s Office of Arts, Culture and the Creative Economy and WHYY for co-hosting this event and inviting Canary Promotion to participate!